The PacSafe Coversafe V75 is helpful for those times when you can never be too careful, the everyday Coversafe V75 RFID blocking neck pouch (freq:10MHz to 3GHz) is ideal for concealing your passport, cash and credit cards in crowded areas or while in transit and perfect for preventing would-be identity thieves from trying to download your personal information. Shoulder Strap (Drop Height) : 13.2" – 29.5"
The Pacsafe Coversafe V75-Neutral Grey has many exciting features for users of all types. It's one of FactoryOutletStore's best selling Pacsafe Wallets. 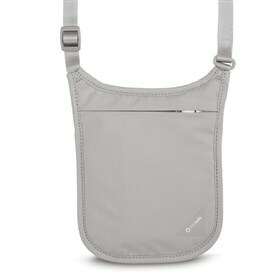 See the Pacsafe Coversafe V75-Neutral Grey gallery images above for more product views. The Pacsafe Coversafe V75-Neutral Grey is sold as a Brand New Unopened Item.